EPMD is an American hip hop group from Brentwood, New York. The group's name is a concatenation of the members' name "E" and "PMD" or an acronym for "Erick and Parrish Making Dollars", referencing its members, emcees Erick Sermon ("E" aka E Double) and Parrish Smith ("PMD" aka Parrish Mic Doc). The group has been active for more than 25 years (minus two breakups in 1993 and 1999), and is one of the most prominent acts in east coast hip hop. Diamond J, DJ K La Boss, and DJ Scratch were DJs for the group. Smith released The Awakening (2003) on his own Hit Squad label, and Sermon released Chilltown, N.Y. (2004) on Motown/Universal. A Hit Squad compilation LP (overseen by Smith, featuring a new EPMD track) was released on Nervous Recordings in 2004. In March 2011, EPMD performed at the Lawyer4Musicians Hiphop showcase at Venue 222 in Austin, Texas. It was the duo's first time performing in Austin, where they performed many of their early hits as well as cover songs and freestyle rhymes. 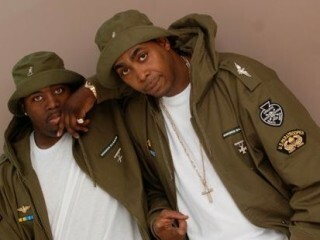 View the full website biography of EPMD.